Did the candles make a difference? Is it time for us to stop lighting the candles and singing Silent Night on Christmas Eve? Most people love this tradition. Some people come to church only on Christmas Eve just for this moment. Many love the memories it brings and the warm feeling. I admit, some of it is the Christmas cranks. In 47 years I’ve probably lit the candles 61 times. Usually by the time we get to the Silent Night point in the worship service I’m tired, my feet hurt and I’m ready to go home. But my dissatisfaction is more than bah humbug. Sokoloff says the campaign worked because of beauty and surprise. It awakened a longing, but didn’t satisfy, for Christmas with family and friends. The lights led the FARC soldiers to risk leaving the jungle to find what they sought. Do the candles on Christmas Eve lead us somewhere new? If they awaken a longing for a deeper relationship with God and a closer connection to our neighbor, then let’s keep doing it. But if they just give us a momentary feel good feeling, point us only to the past and not to a new future, then maybe it’s time to blow them out. I’m at least half way through my life and I need more than Christmas card Christianity. I need more than sentimentality. My faith has become grittier in the last few years. Following Jesus needs to make a real difference or it’s just a waste of time. I don’t think the candles lead us anywhere new, and are indeed a throwback to a time when candles were the primary source of light. They are a tradition, by definition a look back rather than a look forward. But I don’t think that that alone is a reason to drop them. Age affects everyone differently. You say that you find yourself needing more, and I understand that. But there are many of us who hold dearly to the traditions of the past. They ground us and comfort us. They are familiar. The late service on Christmas Eve is referred to by many as “the candlelight service” and if it brings us memories of happy Christmas Eves past, no matter how fleeting, then I think that is a good enough reason to keep the tradition. Not everything has to have a deeper meaning or move us forward. Bringing happiness and good feelings can and perhaps should be enough, especially in these days when both are less plentiful than before. Consider the alternative. Attendance, especially among older congregants, is waning. Do you want to overhear anyone saying “…and then when they stopped lighting candles on Christmas Eve because the pastor said it didn’t do anything for her, well that’s when I finally decided that this wasn’t my church anymore”? Bob, traditions are important and they do ground us. And as you point out, some battles just aren’t worth fighting. I just wanted to point out that if the church is only about tradition (and I’m not saying it is), I don’t think it’s living up to its mandate. Bob, I hear you. I attend a church near Boston and we adore Candlelight Service when we can stand in one large circle of light around the sanctuary, singing Silent Night. It’s been a beloved tradition here for years and it is deeply satisfying seeing young adults return from college and then to see these same adults return with their families. I don’t hear Melissa asking me to cancel those services, but to better illuminate practices which flow from that circle of light. Otherwise it is just another “gala.” Thank you for your wisdom, Melissa! I take a very simplistic view of the practice as symbolizing the underlying Christmas message of light coming into darkness. 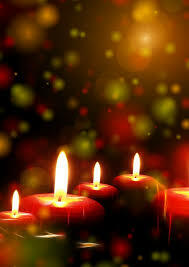 The idea of passing a candle further focuses on the idea that we are all part of that light. But I agree it should be a forward looking message, not merely a nostalgic look at one’s Christmases past. I would always vote for candles. They have such a calming effect on me, and I feel like they make any event more special. Erin, judging from the comments here and on Facebook, keeping the candles is a clear winner.